ST. MEINRAD—When the votes were being announced one by one on June 2, Benedictine Father Kurt Stasiak kept hearing his name called out as he and his fellow monks sat together in a room adorned with paintings of monastic virtues and Christ in glory. Father Kurt closed his eyes and had a “peaceful feeling” as the votes confirmed in his mind that his fellow monks were asking him to serve as their new leader. 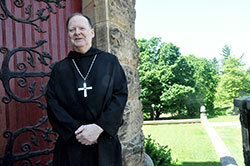 Father Kurt thus became Archabbot Kurt, only the 10th abbot and seventh archabbot in the 162-year history of Saint Meinrad Archabbey in St. Meinrad. He succeeds Benedictine Father Justin DuVall, whose resignation as archabbot took effect the same day as the election. Elected on Dec. 31, 2004, Father Justin announced in January his intention to resign on June 2. Abbots in the Swiss-American Congregation are elected to an indefinite term. From the time of his announcement until the day of the election, the monastic community met several times to discern the qualities they desired in their next leader and which monks might have them. Soon after Archabbot Kurt accepted his election, news of it was passed on to the novices and junior monks who have not yet professed solemn, lifelong vows and had not participated in the election. They then began to ring all six of the bells in the monastery’s Archabbey Church of Our Lady of Einsiedeln. Hearing those bells shook Archabbot Kurt out of his peacefulness and into the enormity of what had just happened in his life. The intensity of his emotions only increased when, a few minutes later—now wearing a pectoral cross and sitting in the presider’s chair in the Archabbey Church—he received his fellow monks one by one. Each ritually placed their hands in his as they professed their obedience to him and gave him a sign of peace. It was “psychologically, spiritually and emotionally profound—very moving,” he said. It’s a feeling, though, that he readily admits he could have easily never experienced if a few things at the beginning of his life had been different. Archabbot Kurt was born in Germany to German parents in 1952. His father died five weeks after he was born and his birth mother, with two older sons also to care for, soon knew that she could not also provide for her baby. He was then adopted by Joseph Stasiak, an American Air Force officer stationed in Germany, and his wife Suzanne. Although baptized a Lutheran, Archabbot Kurt was raised in the Catholic faith of his adoptive parents and fully initiated into it. Archabbot Kurt came to Saint Meinrad for the first time in 1970 as a college freshman seminarian for the Diocese of Richmond, Va. Although turned off at first by the life of the monastic community, by the time of his graduation in 1974, he had come to value it enough to seek acceptance as a novice in it. He professed vows as a monk a year later, and was ordained a priest in 1980. After completing graduate studies in Rome, Archabbot Kurt taught sacramental and liturgical theology in Saint Meinrad Seminary and School of Theology. He has also served in the administration of the seminary as its director of spiritual formation and as vice rector. In the monastery, Archabbot Kurt has ministered as vocations director and as secretary to the archabbot. He served as prior, second in leadership in the monastery, from 2010 until his election on June 2. Living as a monk for more than 40 years and serving in leadership in the monastery makes Archabbot Kurt keenly aware of both the weight of his office, and the help he will receive from his fellow monks. “The abbot is far from being a one-person job,” he said. “That would be crushing. That would be impossible. Archabbot Kurt also hopes to maintain the “very friendly” relationship that the monastic community has had with the Archdiocese of Indianapolis from its beginning. Most of the archdiocese’s permanent deacons and many lay ministers serving in parishes across central and southern Indiana have also been formed for ministry at Saint Meinrad. While he is aware of the effect he has had on so many of his fellow monks, diocesan priests and lay Catholics through his teaching and ministry as a monk and priest, Archabbot Kurt hopes that his election will change his life. “I think I’m a grateful person and a thankful person. I would like to become that even more,” he said. “When you enter something like this, you’re really aware of the people that have built you up, have made you who you are and have taught you those skills and attitudes to enable you to [serve as abbot]. Those abbots all wore the pectoral cross that Archabbot Kurt has worn since his election. The night after he was elected, he slept peacefully until he happened to wake up at about 3 a.m. and saw the light of a nightlight in his monastic cell reflect on something unusual. He pointed to his pectoral cross that he was wearing around his neck and was laying across his chest. “I thought, ‘Oh my God. I’m the abbot’ at 3:00 in the morning,” he said.